So many women take for granted that we have access to feminine hygiene products, safe in the knowledge that we will feel comfortable and clean throughout the month. Some can forget what a luxury it is to be able to nip into Boots or Superdrug and ‘splash out’ on a box of tampons which will allow us – if adverts are to be believed – to run along gleaming beaches in floaty caftans. Sadly, this is not the case for many women. Indeed it is truly dismaying how – even in a supposedly rich, developed country like the UK – there are still women and girls who are inadequately supplied for when Aunt Flo comes to town. FREE SANITARY PRODUCTS FOR ALL!!! After many emails saying “I’ll get back to you” or “I’m not sure” I’m tired of @uwebristol not addressing the crisis that is period poverty in the UK. Therefore, I, Daisy Wakefield have been forced to take matters into my own hands by supplying FREE sanitary products on all @uwebristol campuses. (Due to funding this with my student loan there is limited supply, so head to your nearest UWE bathroom soon if you are in need). In recent years, there has been a greater focus on period poverty within schools, with activists and MPs alike recognising the true damage such hurdles can have for the future prospects of young girls. According to the Free Periods campaign, one out of 10 girls in the UK cannot afford to buy menstrual hygiene products and this is having a devastating effect on their chances of getting a quality education. More than 137,700 children across the UK have skipped school on account of period poverty, with 40 per cent of girls having been forced to used loo roll instead (for men reading this, wads of thin, rapidly disintegrating paper really doesn’t cut the mustard). Disturbingly, if a girl misses school each time she menstruates, she is set back 145 days behind the boys in her class. This means we really can’t talk about ensuring girls become successful, confident women without using the – often dreaded – P word. But what about when such girls make it through school, only to face period poverty as they scrape and scrimp their way through further and higher education? There is still such disparity in universities between students from affluent backgrounds, and those coming from poorer families who have had to watch the pennies. And period poverty is an important part of this discussion. This is unfortunately a woefully under-addressed issue at many universities, driving students such as Daisy Wakefield to take action. 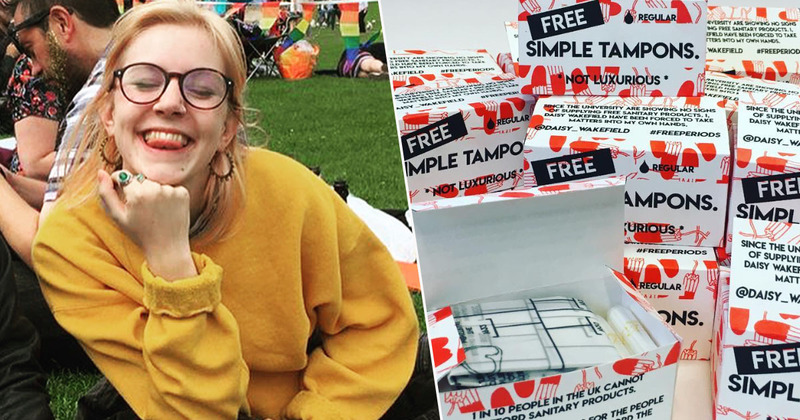 A third year Drawing and Print student at the University of the West of England (UWE), 22-year-old Daisy has used her own student loan to help fellow students suffering from the effects of period poverty. Generous Daisy spent over £100 on filling 40 boxes with tampons and sanitary towels. She also dedicated time to designing and printing the eye catching handmade boxes. Calling all staff and students! We have launched the @RedBoxProject to eradicate #PeriodPoverty amongst young women at our college. You can donate by dropping off sealed products at any of our reception areas at all campuses. As the president of the UWE feminist society, Daisy has undergone extensive training surrounding the topic of period poverty and has campaigned consistently for free access to sanitary products for students. Daisy came up with the idea for these handmade boxes after becoming fed up with her university allegedly failing to provide these necessary items. I became passionate about ending period poverty nearly four years ago when I was introduced to the pink tax. I believe period poverty is a feminist issue because not enough people are talking about periods let alone period poverty. Therefore, it leaves a lot of people feeling ashamed of their cycle but then further ashamed that they can’t even afford the necessary products. None of us like to admit we’re struggling financially, especially when it concerns something so personal and rather taboo. I couldn’t even admit to being on my period without going bright red until I was about 23, and I know I’m not alone. One in 10 people who menstruate in the UK can’t afford sanitary products so this isn’t something that is just affecting a small fraction of people. You most likely know someone who is suffering from period poverty, which is why I felt I needed to do something. These boxes have been distributed across UWE campuses for a limited time, but Daisy hopes they will have a more lasting effect. I’ve been receiving a lot of emails and messages from them suggesting I jump through certain hoops that I have in fact been doing through my three years at UWE. Additionally, I want them to take this seriously. Universities provide FREE mental health support which they have invested money in. Why? Because people need that support. It’s the EXACT same with period poverty. UWE and all universities need to stop turning to charities and volunteers such as the Women’s Forum to provide support and actually invest money to finally put an end to period poverty. My message is ultimately to destigmatize period poverty and menstruation as a whole. As a society we have been told to be quiet about our periods. So it’s no wonder people feel they can’t speak up about suffering with period poverty when so many can’t even talk about their period. Speaking personally, working in an office where there is a well-stocked basket of pads and tampons readily available in the ladies’ loo has removed significant anxieties. Sanitary products – still frustratingly classed as a luxury item – don’t come cheap and even adult women like myself who earn above the living wage can admittedly still feel the pinch when rationing those last few pricey pads. Over the course of the average woman’s lifetime, she will spend £18,000 menstrual products, setting her back around £13 each month. For many people, this £13 can be the difference between hunger and a full belly, bus fare or a long, cold walk to work. Young women attending universities shouldn’t have to be hindered by their periods, left feeling self-conscious and restricted. They should be busy studying and finding their passions; joining clubs and societies and going out dancing and playing awkward drinking games until the early hours. Daisy is an absolute hero for working to ensure female students on her campus get the absolute basics they need in order to participate fully in student life. Plenty of universities across the UK need to sit up and take note of Daisy’s strong sense of compassion for young women who just want to learn and live their everyday lives with dignity.